I think it goes without saying that we could both afford to fine tune our skills and broaden our set lists. So here's this week's project - 6 basic ukulele chords to get us all strumming in time for some summer BBQs. I like to think of myself like this hula girl, but evidently ukuleles aren't just for the beach - check out this Ukulele Orchestra! Think of chord tabs like a map - they're telling you where on the uke to put your fingers while you strum. To get your bearings: the wide band at the top of each grid represents the end of the neck where the tuning nobs are; Left is the top string, right is the bottom. Put a finger on each string and fret where there's a dot, and strum away. 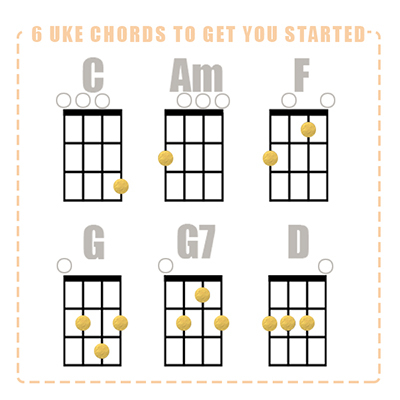 Different combinations of these 6 chords can get you through a ton of songs. The chord progression of D, C, and G alone is all you need to play many popular songs, including, just to name a few: "Knocking on Heaven's Door," by Bob Dylan; "Sweet Home Alabama," by Lynard Skynard; "You Can't Always Get What You Want," by the Rolling Stones; "Ring of Fire," by Johnny Cash; "Sweet Child O Mine," by Guns N Roses; "Leaving on a Jet Plane," by John Denver; and folk classics like "Will the Circle Be Unbroken," "This Land is Your Land," and "Amazing Grace." Phew - that should get us all through quite a few bonfires. And just might impress Marisa's nephew. Below is a song I've been singing a lot in the last year, since my daughter Vivi was born. It uses three of the basic chords from above. Finally a new set of songs I can move onto! Hope it inspires you to pick up a uke of your own.